Please use our suggested clothing list below as a guideline only. Clothing and equipment needs vary with each camper depending on camper preferences, age and length of stay. If your camper likes to change clothes often, then please increase our recommended quantities. When you think about the best way to pack for your Kennebecer – think in terms of layers. Mornings and nights in the country are much cooler than the middle of the day. So campers are the most comfortable when they can layer a t-shirt, with a sweatshirt or a long sleeve shirt or some other top or jacket – one that they can easily remove as the day heats up. Also, think carefully about possible weather conditions when your child will be attending camp. Mid to late August nights and mornings can be very cool. Please pack jackets and light gloves. Pay special attention to footwear. Extra shoes and socks are always a good idea. Shoes and socks get wet and muddy at camp – another reason that we ask you to think twice before you send expensive clothes or shoes to camp. Also please provide footwear that allows your Kennebecer to participate in favourite activities. For example, if campers plans on spending time around the horses, closed toe shoes are mandatory. And if they want to spend a lot of time at riding or help us feed and take care of the horses, construction or riding boots are a good idea. We do laundry once per week per cabin, for campers who stay a minimum of two weeks. Unfortunately, there isn’t enough time to provide laundry service for one week campers. Please do not send irreplaceable or valuable items to camp. While we do our best to keep track of camper clothing and personal items, campers regularly lose and damage their belongings at camp. That’s why it’s so important that you clearly label everything your camper brings to camp. 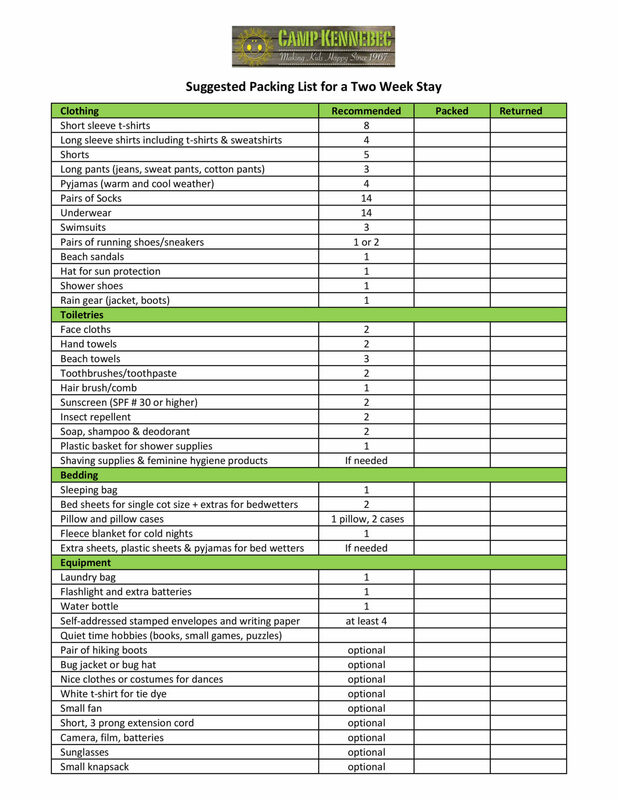 Please use our suggested packing list as a guideline. Clothing and equipment needs vary with each camper depending on their preferences, age and length of stay. Please adjust quantities and items to meet your Kennebecer’s needs. To prevent loss, use sew-on or iron-on labels or a permanent waterproof marker to label all clothing, bedding, and equipment with your Kennebecer’s name. Include a packing list in your Kennebecer’s duffle bag, so we can help keep track of clothing. We do laundry once per week for campers who stay longer than one week. Despite our best efforts, campers often lose or damage clothing and other items at camp. Please do not send money, valuables, expensive or delicate clothing, or mobile phones to camp. Campers simply do not need them while they’re here. It is camp policy to collect mobile phones and store them in the office, until the end of the session. Camp does not replace lost or damaged items.